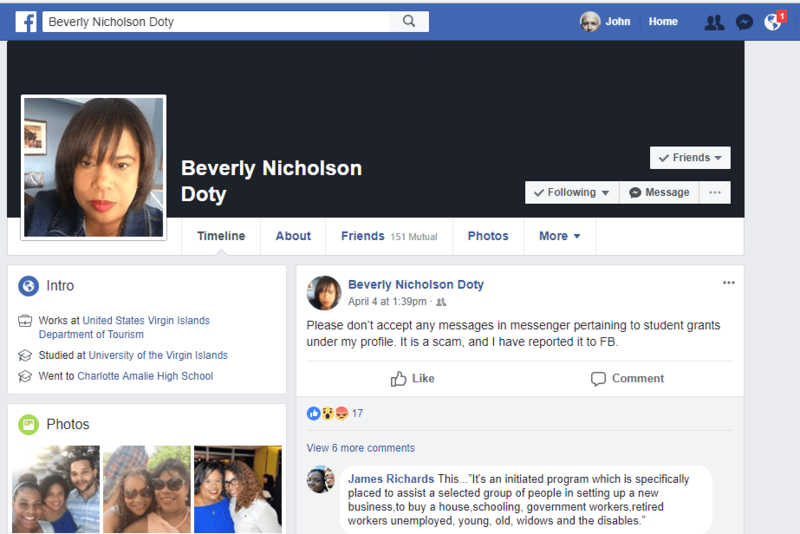 CHARLOTTE AMALIE — A Facebook clone of Tourism Commissioner Beverly Nicholson-Doty is asking people in the Virgin Islands to apply for National Endowment for the Humanities grants, the Virgin Islands Free Press has learned. The scammer uses the same profile picture that Nicholson-Doty uses on Facebook, so it is nearly impossible to tell them apart except for what they write to you. In a case the V.I. Freep closely monitored today the Facebook clone of Nicholson-Doty began by asking how the scam victim and their family were doing. After normal social pleasantries, the Facebook clone of Nicholson-Doty encourages the scam victim to apply for an “NEH grant” in New York City. The incident has been reported to Virgin Islands Attorney General Claude Walker, the National Endowment for the Humanities and Nicholson-Doty. As far the V.I. Free Press knows, the local justice department, headed by Walker, is not investigating the incident despite the complaint being filed. Nicholson-Doty said she wrote to Facebook 10 days ago about the NEH grant scam, but they have failed to do anything about it up until today. They said the scam involves someone claiming to be an NEH employee contacting you through Facebook Messenger or text telling you that you are “on a list for a grant,” and instructing you to send payment before they will send you the grant funds. Please be advised that this is a scam. NEH and its employees will never ask you to send money to receive a grant or other forms of financial assistance. Nor will NEH and its employees ever ask you to wire money or add money to a prepaid debit card to pay for associated processing or delivery fees. NEH does not use Facebook or text to contact individuals concerning grant awards. If the name on the Facebook account is familiar to you (such as a friend or NEH employee), the scammer has created the account to impersonate someone you know in order to initiate and support this fraudulent scheme. Do not provide any personal information or send money to anyone claiming to be an NEH employee. If someone purporting to be an NEH employee has contacted you through Facebook, please report the incident to Facebook so that it can remove the fraudulent account. In addition, you may report the incident to NEH’s Office of Inspector General at 1-877-786-7598 or via email at oig@neh.gov. You may also report it to the Federal Trade Commission at https://www.ftccomplaintassistant.gov, and the Federal Bureau of Investigation (FBI) at http://www.ic3.gov. Please take the necessary precautions to protect yourself. CONCH: It's What To Eat Here When In Season ... But For How Long Will The Supply Last?